Arriving in Probolinggo, either by train or by bus would be challenging to reach to Cemara Lawang. As we read before on Lonely Planet that this place was full of scam practice, it was real. Local people there are quite rough to scam foreigner, here on this post we will try to write a rough guide to reach Cemara Lawang to avoid scam practice. Arriving at Probolinggo Train Station, take a yellow bemo with D letter to Bayuangga Bus Terminal. It will take approximately 30 minutes drive that will cost IDR 5.000 / Person. The bemo is a public transport, so there is no need to pay more even for foreigners. Bayuangga Bus Terminal, here is where the challenge coming from. The bemo driver will probably drop you off just in front of travel agencies. Accordance with our previous experience, they told tourists that the only way going to Cemara Lawang was by hiring private car that cost IDR 600.000 / Car. They were all lie, there was a public bus (locals called Bison) which available inside the bus station. The bison would cost IDR 35.000 / Person, but it won't go until all the passengers seats are full. Last bison available until 04.00 PM. It directly drive to Cemara Lawang but in any chance the driver will try to drop passengers below at Sukapura (Yoschi's Hotel Area) as he will get some commission from the hotel for dropping guests to stay at the hotels in Sukapura area. Please make sure you are dropped off at Cemara Indah Hotel, unless no reservation made for this hotel. Cemara Indah Hotel is the closest place from Bromo area, Bromo landscape is in front of the hotel's door. There is small path at the backyard of this hotel that lead to Bromo Crater. It is doable by walk about 1 hour, we arrived quite early so we did it for the sunset to Bromo crater. 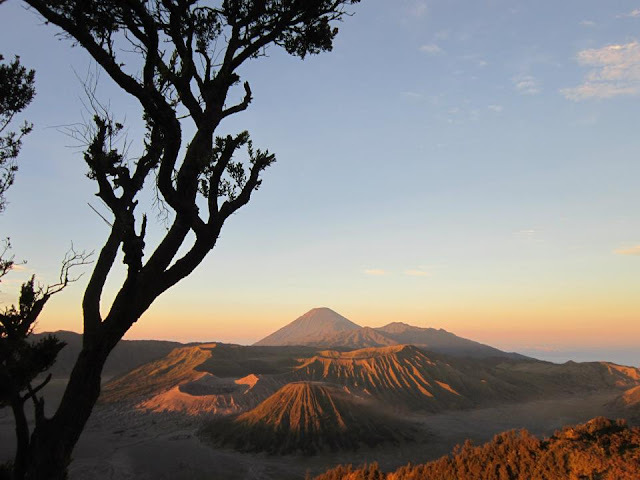 Hike Bromo Crater for the sunrise could be very crowded especially on the high season. As showed on the map above, there were two different viewpoint for viewing sunrise (View Point 1 & View Point 2). Both of them were located at the same Mt. Penanjakan, instead View Point 2 was located lower than View Point 1 but they represent similar view. Most of visitors will hire a jeep that would cost for IDR 450.000 - IDR 600.000 Per Jeep (Max. 6 Persons). The driver will take visitors to Penanjakan VP 1, that too crowded of people. Even it was really difficult to put your tripod for getting a nice picture. A hassle came out when there were traffic and jeep driver will drop visitor off 1 km away from VP 1. 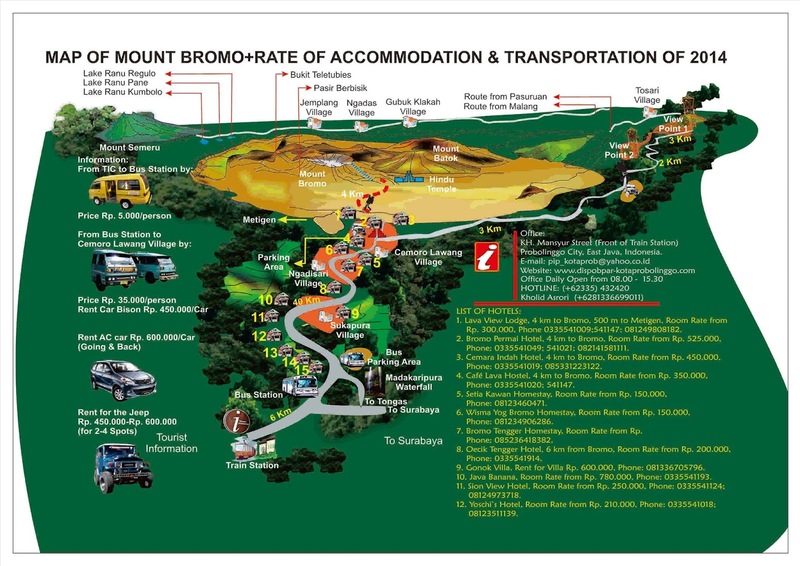 After sunrise at VP 1, the jeep will stop over at Bromo Crater so that visitor could hike Bromo. Last stop the driver will drop you off at the hotel. As we did Bromo crater hike for the sunset and wanted to avoid the crowd, we decided to go to VP 2 for the sunrise. From Cemara Indah Hotel just take turn to the right path, it was only about 5 km walk a nice road. Just follow the path, there was a sightseeing building where we could enjoy the view with no overcrowded tourists.